Large international teams are required to undertake galaxy surveys, and I help to run groups of scientists completing the on-going Baryon Oscillation Spectroscopic Survey (BOSS, www.sdss3.org), the Dark Energy Survey (DES, www.darkenergysurvey.org), and the future extended-Baryon Oscillation Spectroscopic Survey (eBOSS, www. sdss3.org/future) and the European Space Agency mission Euclid (http://sci.esa.int/euclid). I am also involved in a number of other surveys including VIPERS (http://vipers.inaf.it), Fastsound and DESI. 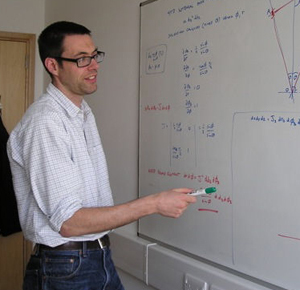 I have been a Professor of Cosmology at the University of Portsmouth since 2011, having joined as a senior lecturer in 2005. Before this I spent 6 years a postdoctoral fellow at the University of Edinburgh, following completion of my PhD at the University of Oxford. My research interests focus on the properties of the Universe on the largest scales. Surveys of three-dimensional galaxy positions provide a wealth of data both on the physics just after the Big-Bang when the seed fluctuations that will grow through gravity to become galaxies were created, and on the physics driving the evolution of the Universe today. I currently lead a research team in Portsmouth looking at all aspects of such surveys, from creating the theoretical models to test against observations, through to making and analyzing the observations themselves. Chinese Academy of Sciences ``Distinguished Scientist'' fellowship 2016. Co-recipient of the 2008 Royal Astronomical Society team award for the 2dF Galaxy Redshift Survey. Royal Astronomical Society 2008 Fowler Prize awarded to “individuals who have made a note-worthy contribution at an early stage of their research career”. I currently manage a number of research grants from the UK Science and Technology Facilities Council, the UK-Space Agency, and the European Research Council (starting grant in 2007, consolidator grant in 2013). European Space Agency Astronomy Working Group (2013-present). STFC Astronomy Grants Panel (2013-15). Isaac Newton Group of Telescopes Science Advisory Committee (2011-13). European Astronet Working Group “next generation wide-field spectroscopy” (2009-11). Graduate lecture series on large-scale structure. Applied physics project supervision.